ORGANIC CARPET CLEANING NYC – CHOOSE SAFE AND CLEAN! For the Eco-friendly homeowner, we are the premier service provider to call in NYC when you need your carpets cleaned. We specialize in organic carpet cleaning services. Not only do we eliminate the harmful toxins, chemicals, and solvents when cleaning your carpets and flooring, we also guarantee you will be pleased with our cleaning services when you choose us for our services. With years of experience, we utilize the latest cleaning methods, we employ the use of the best cleaners, agents, and equipment, and we only employ the most qualified and licensed cleaning professionals, to provide organic carpet cleaning services in your home. Consider this. You wouldn’t dump harsh chemicals, detergent, and soaps when taking a shower or bathing your kids. So, why would you use these harsh cleaners when having your floors cleaned? Your family, the kids, your pets, friends, and family who visit are all affected by the toxic cleaning agents, chemicals, and solvents which most major carpet cleaning companies use to clean your carpets. We take an alternate approach. We focus on cleaning your floors using the cleanest, organic, and most Eco-friendly cleaning agents when we clean your carpets. This promotes a healthier household, a safer environment for your kids and anyone who enters the home, and it ensures a sustainable environment after our services are rendered. Whether it is cleaning the living room floor, or every room in your home, we only use the cleanest, organic cleaners, when you call us for our carpet cleaning services. We strive to provide the best services, all while offering our customers a healthier and cleaner option when it comes to having their carpets cleaned in the home. 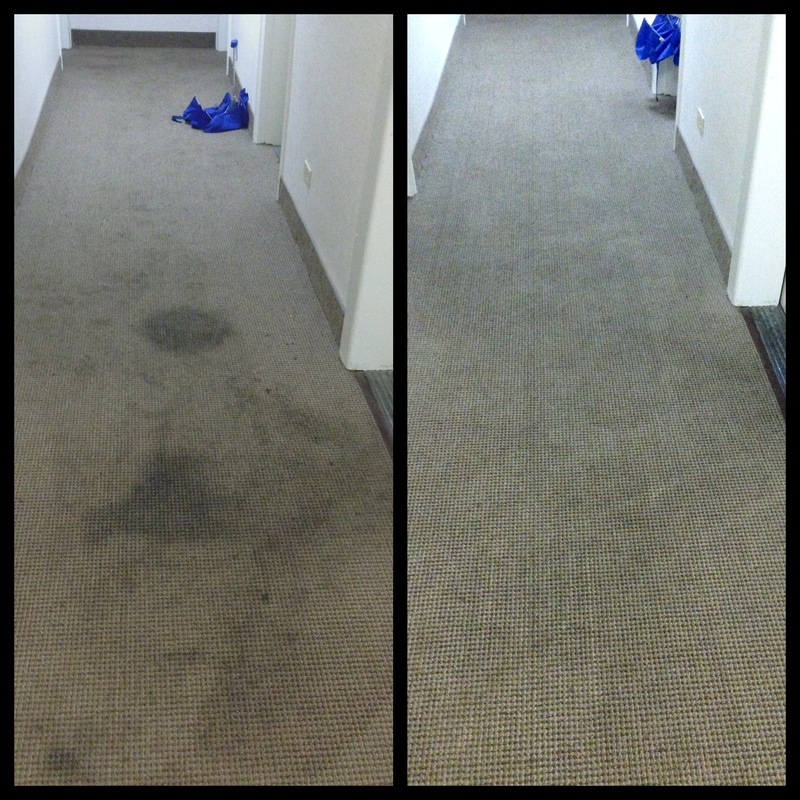 Our organic carpet cleaning services are unparalleled to other companies in the NYC area. In addition to using a proprietary cleaning agent, which was developed by our team of professionals, we guarantee the cleaning agents used are just as powerful as any harsh chemical cleaner, and will do the job just as well (if not better), all while eliminating the risks which are posed by chemical cleaners. Our cleaning agents eliminate the harsh chemical agents found in commercial cleaning soaps which most major carpet cleaning companies use. We remove all allergens from your carpets and upholstery, employing the use of our natural, “Green” cleaning agents. We also ensure to eliminate a majority of the airborne bacteria from your carpets and flooring, to help improve the air quality in the home, and to ensure your floors and upholstery look brand new once we are finished with our services. Our cleaning solutions are as natural as can be found on the market today. 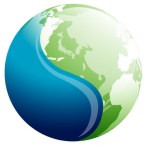 All of the ingredients used to produce our cleaning agents are produced by Mother Earth. No harsh chemicals, dyes, or toxins are used to produce the cleaning solutions we use when cleaning your carpets. Our products are “Green-Certified.” This is a guarantee that they are safe, they won’t cause damage or threats to anyone in the home, and they are all natural. All ingredients used in our cleaners are GRAS (from the generally recognized as safe list). No phosphates, sticky residue, or toxins are left behind, meaning the areas we clean are safe for your kids and pets, the minute we are finished with our cleaning services. – General carpet cleaning, using the cleanest, organic solutions to get rid of tough dirt and stains. – Spot cleaning services. Allowing for a deeper clean and allowing us to target deep set in stains or marks. 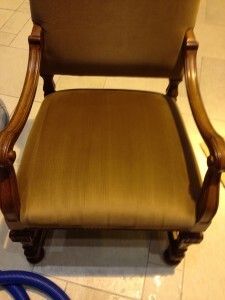 – Upholstery cleaning. Allow us to remove red wine, chocolate, or other tough stains from your couches. – Odor removal. With our all natural cleaning solutions, we can get rid of the pet odors, and odors which are present in the floors from everyday wear and tear. We can also spot treat urine stains, pet spots, or other hard to remove stains. If you have tried every cleaning method imaginable, only to fall short of getting the carpets to look good, give us a call. We ensure our services are going to remove the tough set in stains, and we ensure your carpets are not only going to look better, but are also going to smell better once we are finished with our services. Our all natural shampooing agents are going to eliminate the stuck on stains and odors. And, with the all natural ingredients used in our cleaners, you won’t notice the heavy and harsh smell of chemicals, which is generally the case when you hire a general carpet cleaning company for the job. At PureGreen our organic carpet cleaning NYC services are unparalleled to that of what other local competitors have to offer. For starters, we only employ fully licensed, trained, and certified professionals to render the cleaning services. Therefore, we know any one of our professionals that are called to your home will do the job right the first time. 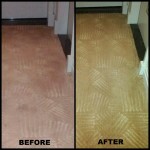 We also ensure to use the best, organic, natural cleaning solutions to get your carpets cleaned. Whether it is spot treatment, or general carpet cleaning, we use the latest methods, and best cleaners to remove stains. We are so sure you will be pleased with our work, that we guarantee the best clean, and your satisfaction, when you hire us for our organic carpet cleaning services. We also guarantee the best rates for the work we do. Give us a call today to learn about the services we offer, to find out more about our natural organic cleaning methods, or simply to speak to one of our professionals, to walk you through our process. We can provide you with a quote for services and set up a date to visit your home. Call us today to schedule an appointment, and see the real difference we can make when you hire us for your organic carpet cleaning service needs in NYC. At PureGreen we specialize in cleaning and restoration of fine area rugs from all over the world. We are confident that our rug cleaning process is the most thorough you can get in NYC! In order to preserve the life of a quality handwoven area rug, they need to be properly maintained. Depending on the amount of traffic and usage that the rugs are receiving they should typically be professionally cleaned every 8-16 months with regular routine vacuuming in between. Wool rugs in particular hide a lot of dust and soil before they even begin to show signs of dirt. 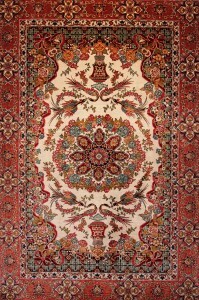 Even with regular vacuuming you cannot remove deeply embedded soil from the rugs without a deep professional cleaning. 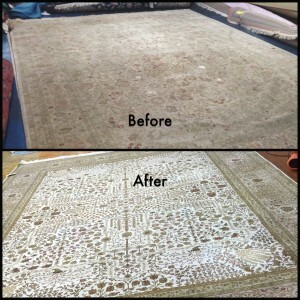 Our customers are almost always shocked to see what we are able to remove from a rug simply with our dusting process. A typical 8×10 wool area rug can hide about 10 pounds of dust before it even begins to look dirty! Our cleaning process begins in your home with a proper inspection. Our NYC rug cleaning technicians will thoroughly inspect your rug for any pre-existing stains or damage and provide you with an inspection report detailing what to expect with a cleaning. Once that had been done we will move any furniture and roll up the rug to transport it back to our state of the art cleaning facility in NYC. As a preliminary process all rugs first go through our thorough dusting/dry soil removal process. This is a very crucial step in the cleaning process that many rug washers tend to skip. Without a proper dusting process the rugs are not being cleaned to their full potential. By skipping the dusting process and going straight to the wash, all the dirty soil and dust gets mixed up with the water and in turn becomes a muddy mess that most often does not get fully extracted from the rug. The results are a sub-par cleaning…and we do not cut corners. After the dusting process we will then pre-treat any pre-existing spots that may need special attention, for example urine stains, red wine or coffee stains. Once that has been done it is time for our soaking process. We fully submerge the rug in our custom fit wash pools so that both front and back get a thorough cleaning. This process helps remove all deeply embedded soil from the rug and if pet odor is an issue, they will be long gone after the soaking. Once the rugs have been soaked and hand washed we extract any remaining water and either hang them up to dry or dry flat depending on the area rug. Our temperature controlled dry rooms ensure for a fast dry time. As an optional treatment we can also apply a wool safe fabric protector onto the rugs to keep them clean in between cleanings. 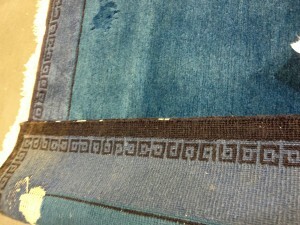 We recently picked up and cleaned a severely soiled area rug from one of our customers. 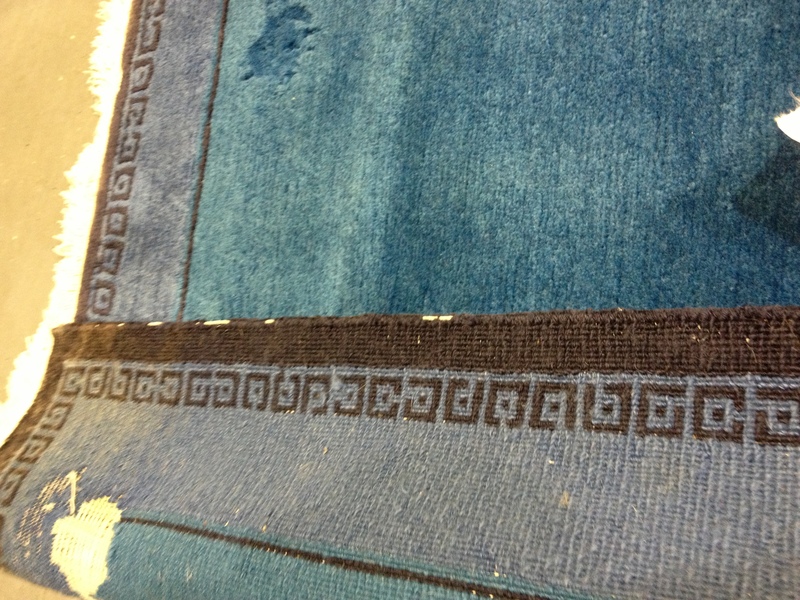 This was a valuable rug and required a deep restoration cleaning. We did have to clean the rug twice but the end result was something both we and our customer were proud of! Take a look at the before and after photos below! 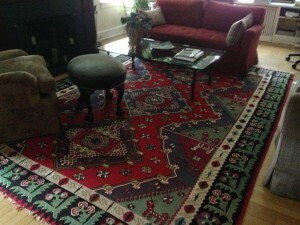 If you are in the Manhattan area and are looking for rug cleaning services we would be happy to assist you! Give us a call today to meet with one of our rug cleaning NYC technicians! We receive calls all the time with the same issue. HELP! Moth are eating my rug!! 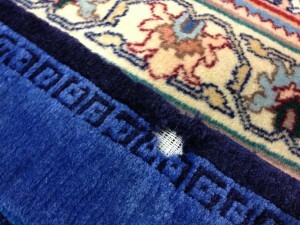 Moth damage to an area rug can be devastating. In many cases the damage can be too far gone for repairs, however early detection can save your rug. 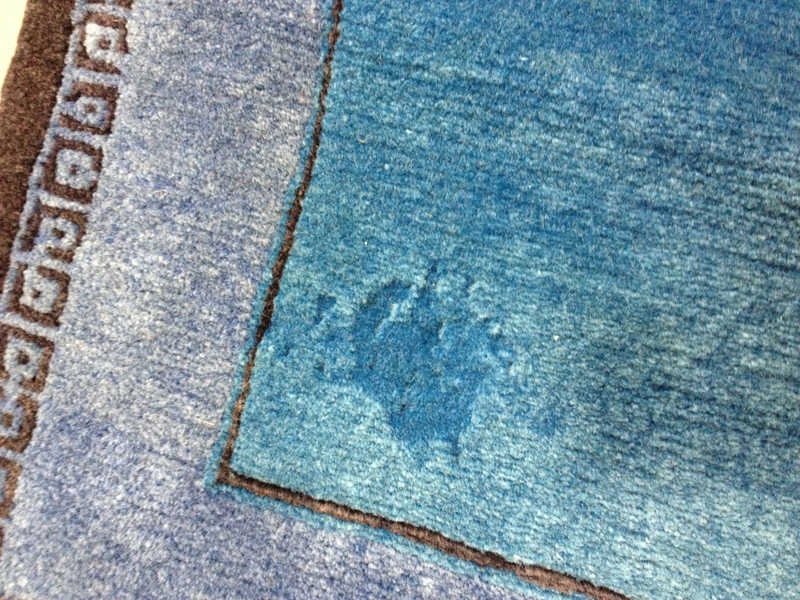 Moth are attracted to wool rugs because of the high protein content the wool provides for their larvae. The moth will lay there eggs in the rug and when the larvae hatch….free lunch! They thrive in dark corners and will often times do there damage without you even knowing about it. This is why regular vacuuming and deep cleaning once a year is recommended. Having your rug professional cleaned will keep it free from pests and make sure there are no unwanted visitors using your rug without your permission. 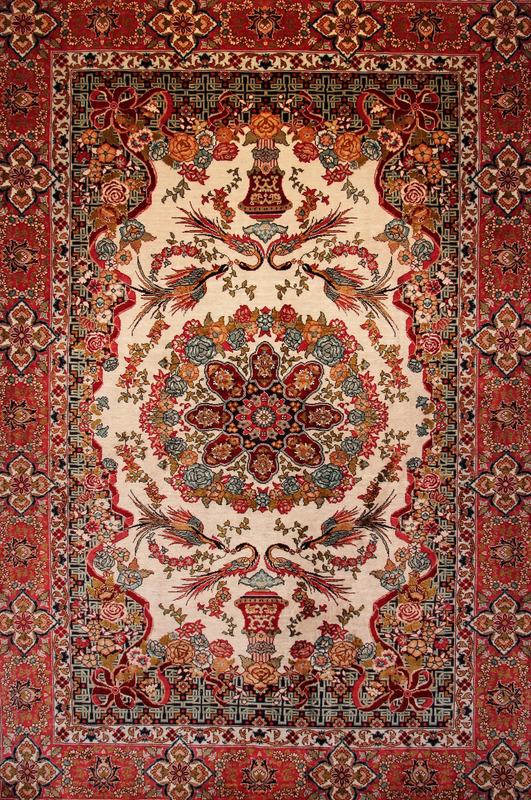 Prevention is the best course of action against moth, however, in the unfortunate event that you have already suffered moth damage on your precious rug we are here to help. Upon inspection our NYC rug cleaning technicians will let you know what to expect with your rug. They will let you know what options you have and whether or not it is salvageable. After discussing your options the technician can safely roll the rug up and seal it for proper transportation to our facility where it will be fully submerged in a lime wash in order to eliminate any living or unhatched larvae. After the wash we moth proof the rug to ensure that moth will not be attracted to this rug anymore. We then thoroughly inspect the rug for damages. 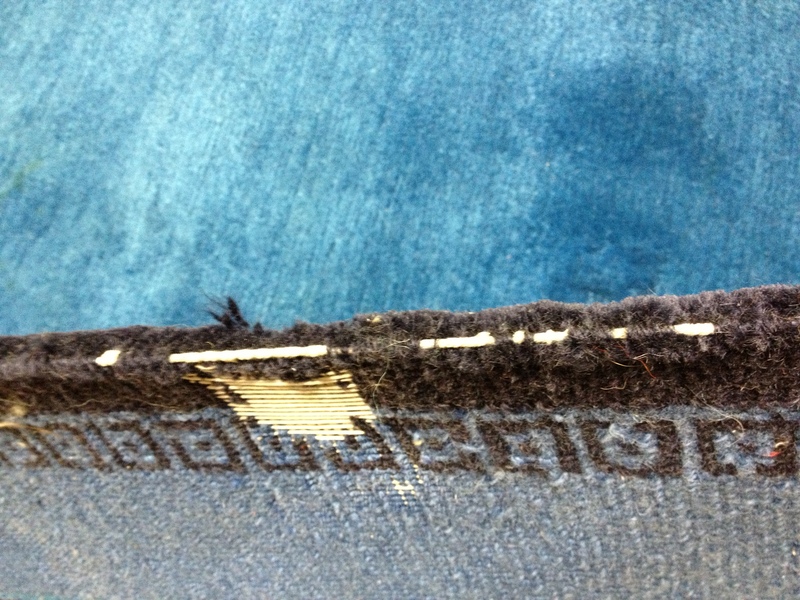 Often times the full extent of the damage will not be revealed until after the wash. What happens is the fibers that the larvae have been feasting on have been severely weakened and any loose fibers will fall apart during the wash.
At this point one of our technicians will call you and provide photos and videos of the rug in its present conditions after wash and offer repair options for your consideration. 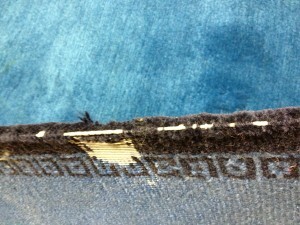 Repairs can include, new binding, fringe repairs, reweaving of holes, patching, color restoration, or dyeing. 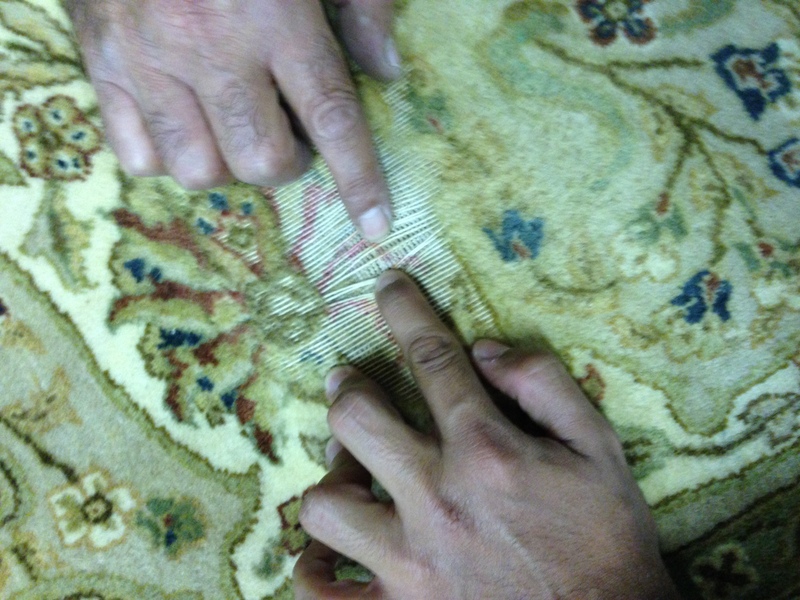 All repair work gets done by hand by skilled weavers which use original materials matching the design and aesthetics of the rug exactly how it was when it was first woven. Our Rug Cleaning NYC technicians will keep you informed every step of the way from pickup time to delivery ensuring a smooth and pain free experience. If your rug is going to be put away for storage we will make sure the wrap in acid free breathable paper and moth proof the rug so that it can be safely put away. It is extremely crucial to clean and moth proof ANY rug prior to placing it in storage because if not, there is a high probability that you will be in for a big surprise when you eventually open up the rug. 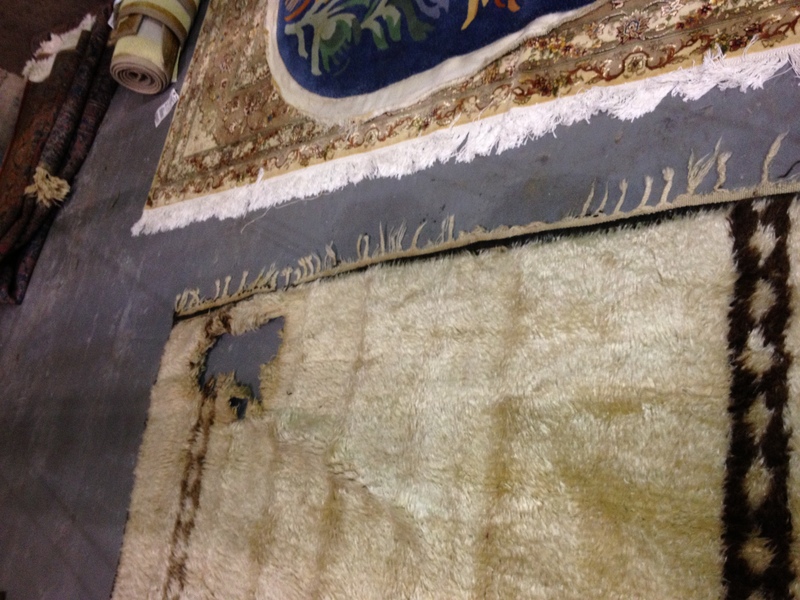 Take a look below at some recent photos of rugs we received that had suffered moth damage. 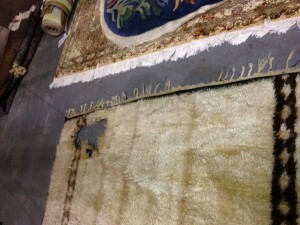 These rugs will all need patching and reweaving which will restore them to their original beauty and condition. 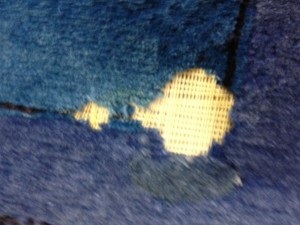 One of the rugs was being eaten in the customers home underneath their couch. They had no idea it was going on until they started seeing several moth flying around the apartment. The others were placed in storage without being properly cleaned and protected first. If you have any questions we would love to help! Feel free to call or email us. People often neglect there upholstery and skip on cleaning them, however the truth of the matter is that your sofas and couches need cleaning as much as your carpets and rugs. We spend a lot of time lounging and sitting down in our comfy sectionals. Our bodies are constantly shedding dead skin cells, hair, and body oil. All of these things become embedded in the fabric of your upholstery and over time can create a dingy look on the fabric and wear it down faster. Not to mention odors. You’d be surprised what we can extract out of your sofa. Lots of times our customers are shocked to see the dirty water at the end of the job because the sofa did not “look” very dirty. When we clean, we perform a deep cleaning which removes all of the surface soil and more importantly flushes out the deeply embedded soil from deep within the fabric. Our upholstery cleaning NYC technicians are fully trained and equipped to clean even the most delicate of fabrics. 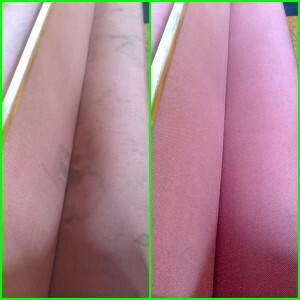 Certain fabrics like silk and cotton can be tough to clean for an inexperienced upholstery cleaning technician however we handle these on a daily basis. Take a look at the example below. 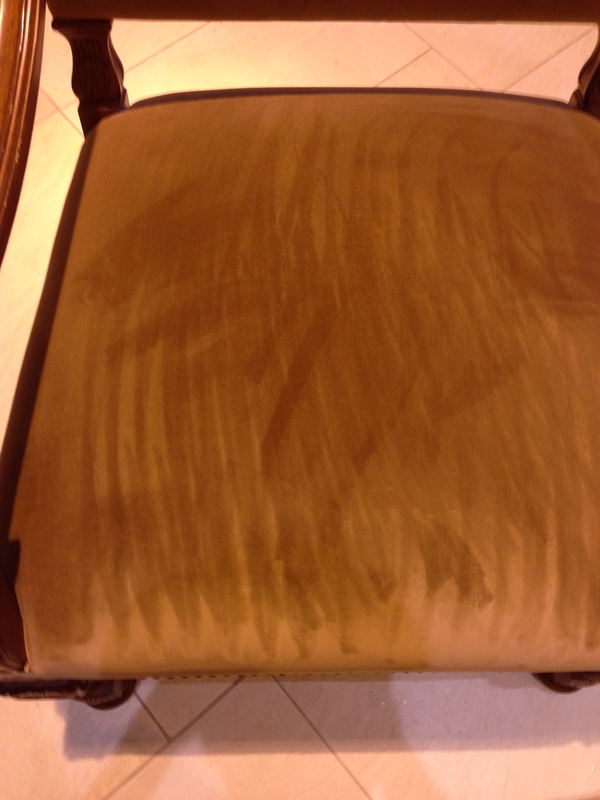 Here we have a customer who tried to clean their upholstered plush chair. 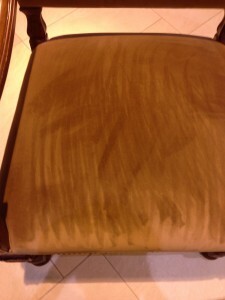 The customer stained the chair and also caused severe pile damage by rubbing aggressively against the nap with a towel. In order to fix this we first had to provide a softening treatment which softened of the fibers and made it possible for us to brush them back into position. After the softening treatment we performed a light hot water extraction to remove the dirt, oils and stains while carefully making sure the pile stays in one direction. Lastly we dried the chairs using blowers to ensure and quick and complete drying. The customer was thrilled with the end result. 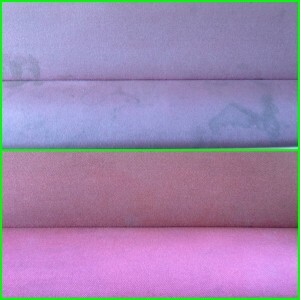 Feel free to give us a call for all your upholstery cleaning needs. We would love to accommodate you! We completely restored the color and the nap on this beautiful chair. Every day we receive new calls for new situations that arise. Every single job we go out on is always unique and that is why we treat each job individually to address the specific needs of that particular situation. Experience and training has taught us how to effectively and safely remove stains and odors without compromising the structural integrity of the fabric we are working with. Our Carpet Cleaning NYC technicians have been fully immersed in cleaning and handling the most delicate fabrics such as silk, wool, cotton, velvet….the list goes on and on. Most companies use harsh detergents which they pour into their machines in order to clean the carpet with. The problem with that is, now you have a lot of soapy, sticky residue left inside your carpet. It may look clean after they leave, but that sticky residue attracts dirt and grime very quickly, and in a couple of days your traffic lanes will not look as clean anymore. The other problem with using harsh chemicals while cleaning is that they produce a lot of off gassing. The soapy chemicals left over in your carpet will give off unpleasant odors which are harmful to your respiratory system and can produce headaches. At PureGreen, we do things differently. 2. We ALWAYS rinse out with pure neutralized water. 3. We EXTRACT any and all cleaning solutions that we put down into your carpet. 4. We make sure to get your carpet as DRY as possible to avoid any re-soiling or odor issues. 5. We GUARANTEE all of our work. If you are not happy, simply call us and we will re-clean FREE of charge. Carpets in NYC tend to get dirty quickly and there are an endless number of companies to choose from. We recommend doing your research and finding the company that you feel the most comfortable with. Reputation goes a long way, and we are very proud of ours! Here is a job we did recently for an apartment building in NYC. The building manager called us in to clean the carpets in the hallways and common areas of the building. Each floor was severely dirty and stained from a long and harsh New York City winter. To make matters a little more difficult these carpets were not cleaned in over 6 years. Thats 6 years of foot traffic, dust, allergens, bacteria and sludge that has been living inside the carpet fibers. We performed a deep shampoo cleaning in which we pre-conditioned the carpet first with our all natural presprays. We then agitated (brushed) the conditioner into the carpet fibers. Lastly we extracted and rinsed out the dirt and pre-conditioner until we were confident it could not get any cleaner. If you are looking for carpet cleaning service in NYC with experience and reputation, we would be happy to serve you! Deep shampoo cleaning in NYC apartment building. One of the biggest problems people face with indoor carpet is that it makes the perfect home for mites, mold spores, and dust. While vacuuming is the first line of defense in cleaning your carpet, eventually your carpet will need to be cleaned with a specialized solution. Many of these carpet cleaning solutions contain a dry cleaning agent called perchloroethylene. Other cleaners may contain naphthalene which is a carcinogenic solvent that has been linked to red blood cell damage. Besides the major cancer-causing risks associated with both of these chemicals, people have often reported dizziness and nausea from the fumes. Pets are affected the same way that humans are. For these reasons, neither of these substances should ever be used on your carpet. Regardless if a toxic cleaner is spritzed, sprayed, or poured, the harmful effects always exist. For that reason, when choosing to have your carpets cleaned, the safest choice you can make is to go with an organic carpet cleaner. Organic carpet cleaning uses only non-toxic and biodegradable cleaners that have a pH balance that is gentle on both your carpet and the environment. When having your carpets cleaned by PureGreen Carpet Cleaning New York, you can rest assured in knowing that they specialize in healthy cleaning of your carpet to ensure the safety of your family and yourself. 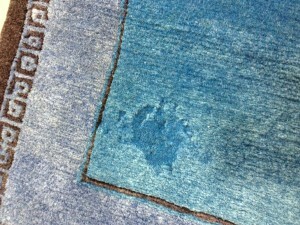 Organic carpet cleaning doesn’t put off the nauseating vapors that regular carpet cleaning can. Not only can non-organic cleaning solutions pollute your home, they can also pollute the outdoor environment. Organic carpet cleaners are a significantly healthier option for both you and the environment. While having your carpet cleaned in a traditional manner leaves you with a lingering vapor, organic carpet cleaning will leave your home smelling fresh and clean. In addition, when using an organic carpet cleaner the possibility of mold growth is greatly lowered over that of traditional carpet cleaning. While it is recommended that you contact a professional for your organic carpet cleaning, like PureGreen Carpet Cleaning New York, the most vital thing is to be aware of the harmful and dangerous chemicals that are often in carpet cleaners that are found at your local supermarkets and retail chain stores. PureGreen Carpet Cleaning New York uses only the best organic plant-based cleaning solutions and non-toxic extraction methods. For your family’s and personal safety, make it point to choose only organic carpet cleaners.